WITH necessary interventions like better internet connectivity, industry stakeholders have expressed optimism that Negros Occidental will produce more online English teachers, especially home-based, amid the growing demand for such digital career. 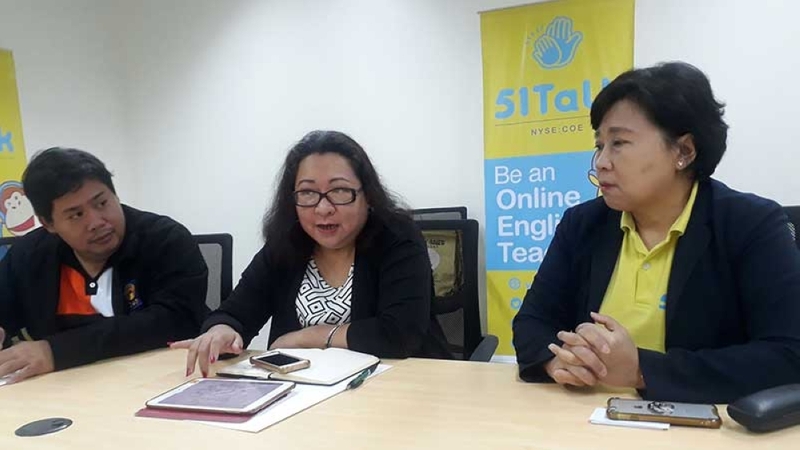 Jennifer Que, vice president for Philippine operations of 51Talk, in a press dialogue at their office at the Negros First CyberCentre in Bacolod City Friday, said their company is currently employing almost 14,000 online teachers across the country. Of which, about 700 are in Negros Occidental comprised of 600 home-based and 100 office-based teachers, respectively. In 2022, within the next five years, it targets to increase the number of home-based teachers to 100,000 nationwide. Que said Negros Occidental, especially Bacolod City, is becoming bigger. Thus, their company is currently more aggressive in terms of aligning its target with that of the province. The Bacolod-Negros Occidental Federation for Information and Communications Technology (BNEFIT) has set a target of at least 3,000 online English teachers by 2022. 51Talk, which was established in China in 2011, is one of the largest leading online English education platforms in the world. Listed in the New York Stock Exchange in 2016, it is recognized for its learning approach that helped develop the online English as Second Language (ESL) scene. It started operating its center in Bacolod City last year, next to cities of Pasig and Baguio. At present, the city is considered the biggest 51Talk center in the Visayas. Que said there is a need to put pressure on the push for better connectivity as a measure to improve the economy. In order to encourage telcos to put up connections especially among far-flung areas, Que said these firms should be told that connectivity means livelihood. Other measures include boosting tourism to invite potential investors, having strong power industry to ensure the reliability of supply, and tapping schools and even Department of Information and Communications Technology (DICT) centers here on improving connectivity, Que said. “We really need the support of the community especially the telcos, power industry players, schools to make employment happen. Telcos should realize that business will happen when they provide that connectivity,” she added. For BNEFIT, its executive director Jocelle Batapa-Sigue said, the province is capable of achieving the 3,000 target, which will form part of the 60,000 over-all ICT industry workforce by 2022. Batapa-Sigue, also the vice president of the National ICT Confederation of the Philippines (NCIP), said the target can actually be surpassed as long as industry stakeholders unite as a community to embrace the new concept of digital careers. “We have to teach our students how to thrive in the fourth industrial revolution where there will be no longer resumes, you build your portfolio, you create your presence digitally, and this is a skill that must be taught in the college level,” she said. Aside from intelligent and emotional quotient, talents have to have an "LQ" or the ability to learn, unlearn, and re-learn, Batapa-Sigue added. The BNEFIT official said they are looking forward to the third telcos to enter as, in the advent of freelancers, connectivity in the area is important. Batapa-Sigue said freelancers would rather work alongside the beach or somewhere conducive for teaching instead of an overcrowded place with a lot of noise. “In so far as BNEFIT is concerned we look at other alternatives, like for example encouraging the growth of more co-working spaces,” she said, adding that one problem in Bacolod City is that, most of its Philippine Economic Zone Authority (Peza) accredited sites are bare. In this online education platform, teachers are teaching English to Chinese young learners, aging mostly seven to 12 years old, for 25 minutes per session. Under 51Talk’s model, teachers before allowing them to teach online are trained on the basics like the needs of the Chinese audience, how to teach English, and the sensitivity of the pronunciation and accent, among others. The training lasts for five hours, plus an hour of demonstration for Chinese evaluators. Que said in this teaching approach, parents pick the materials for the students and the teacher guides them. They can have fun, dance, and sing with the child. She said what the teachers need are only high-speed and wired internet, and a good computer with a minimum of four-gigabyte random access memory (RAM). For people with no computers yet may come to 51Talk center and teach there for one month, and earn their way to become a home-based teacher, Que said. “After launching them as teachers in this platform, we do follow up training for us to improve their teaching skills,” she added. In terms of compensation, an online English teacher can earn P30,000 to P80,000 a month "depending on how hardworking they are." Even non-licensed teachers can apply as long as they can speak English well, a degree holder, 18 years old and above, then proof to do home-based teaching, mainly having the necessary equipment. Que said 55 percent of the applicants usually fail due to problems in internet connectivity, as she stressed that teachers in Negros Occidental are competitive with that of other areas in the country. “Learning English is so expensive in China, so our model is to make the language available, accessible, and affordable to a lot of potential students there,” she said, adding that they currently cater to thousands of children from among the country’s second-tier cities. Interested applicants may apply through the company’s website www.51Talk.ph, social media accounts 51TalkPH, or through landline number 779 – 5151.